At a glance this traveler guitar is just like an ordinary guitar but actually this guitar can be fold up compactly and fit into your backpack. This traveler guitar was designed by Shlomi Daniel and Uri Nir for easy carrying and travel. The designer also say that they designed and crafted the instrument not only for ease and convenience, but also so that it could withstand harsh outdoor weather conditions. How about the sound quality of this traveler guitar? 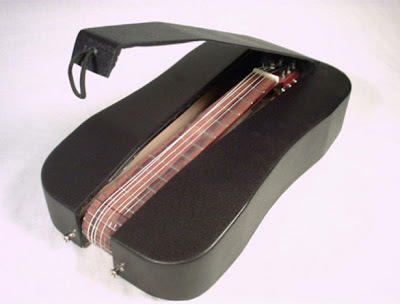 According to the designer, the Traveler’s Guitar produces the same level of sound quality as a normal guitar, and unlike other purported travel guitars, can supposedly produce the same volume as well. It uses a tension-release mechanism during the folding process, and because of this, requires only a quick fine tuning after unfolding it, rather than need to completely take it apart and subsequently re-string it. see also another weird guitar model here. 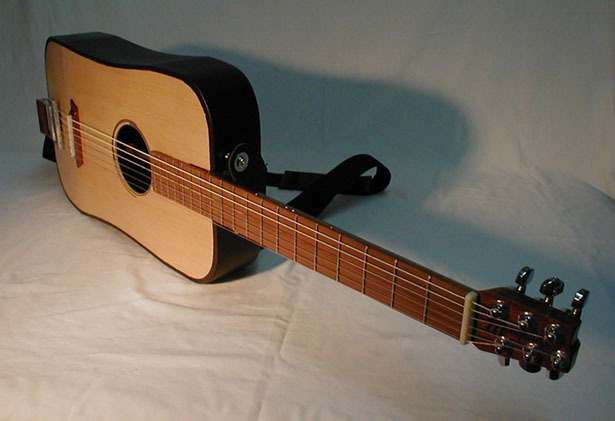 The traveler Guitar used Hardwood, plywood, metal and carbon fiber material. until now these unique traveler guitar does not appear to be for sale anywhere but the designer try to mass produce this guitar in the future.